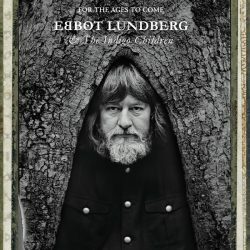 Lundberg’s past as frontman for Soundtrack Of Our Lives (and the much missed Union Carbide Productions) gives us some clues as to what to expect from this solo effort. UCP were heavily indebted to the Stooges and MC5 but it’s another 60’s icon that this set sidles up to; there are definite vapour trails of Love throughout these songs, the strong melodies and the meandering freewheeling flights of fancy straight out of Arthur Lee’s playbook. ‘Beneath the Winding Waterway‘ is a gentle semi-psychedelic trip which is instantly memorable with enough complexity to reward repeated listens. The chief attraction of this record is letting the songs worm their way into your mind – it’s the kind of record that inserts little shards in your memory so you go back to complete the mirror and go through it. ‘In Subliminal Clouds’ is another example of the 60’s influence, the vocals especially along with the baroque acoustic guitar, the billows of harmony, it’s all very pastoral yet sophisticated, the delicate ruffled frill of strings completes the effect. There’s a kind of uplifting melancholy about ‘Drowning in a Wishing Well,’ the Bacarrach and David smooth horns adding that 60’s sheen. Less smooth and more towards Motor City is ‘Don’t Blow Your Mind‘ which adds some grit and grime, the guitars careening into each other scuzzing up the pristine pop. Even the harmonies of the chorus can’t do any more than add a patina of respectability. Things get a little stranger with ‘Calling from Heaven‘ which has the spirit and soul of Love and plenty of touches from the elastic horns and the sitars, and then there’s also a touch of the Beta Band that pushes through, ‘To Be Continued‘ with its more strident brass and multi-tracked vocals also has the same feeling of effervescence filtered through a prism of knowing. This is a fascinating record, one that wears its influences like polished badges and one that seeks to move beyond and find something new, but most of all it’s a great listen. The melodies are often huge – think of how Echo and the Bunnymen made fantastic pop records from their own aesthetic. Lundberg has done something similar here. Next Next post: Americana UK’s Readers Poll 2016 – the results!